Raphaella SMITS plays Napoleon COSTE. Napoleon COSTE was born in 1805, son of of a former officer in Napoleon Bonaparte's Imperial Army. He started his career in Valencienne but soon went to Paris where he met all great guitarists of that time: Aguado, Carcassi, Carulli and Sor. After he broke his arm in 1863 het stopped performing but went on teaching and composing. At his death in 1883 he left behind 53 numbered compositions, several works without opus number, and a revised edition of Sor's Methode, adapted to the seven-string guitar, Coste's favourite instrument. 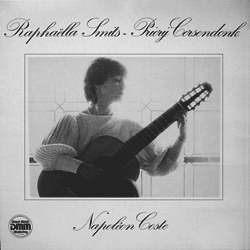 The vibrations of Raphaella Smits' guitar playing remained at the Corsendonk Priory after a few concerts. Constructive talks with Dorian van der Brempt, the manager then, have let to program the First International Guitar Happening. This summercourse with José Tomas and Raphaella Smits was held from August 1 to 9 at the former cloister, now known as the Corsendonk Priory Hotel and Conference Center. This cultural event was not subsidized. With the help of 'Corsendonk Brewery' and 'Miko Coffee' Raphaella Smits realized this first recording of Napoleon Coste's work. All profits of this solo LP were integrally used to finance the guitar course. "Raphaella's interpretations testify to a deep respect for musical literature, and to a close study of it. Her exquisite sensitivity is supported by a first-rate technique, distinguished by precision and richness of tone, full of nuances." "The album gives a clear overview of the different moods that Coste has put in his compositions. They go from melodious and simple through high level technical passages. All played on the highest possible level by Raphaella Smits. A recording of international standard."